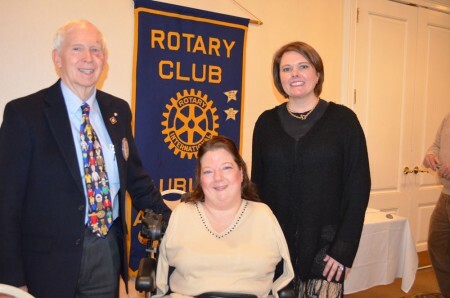 The Auburn Rotary Club recently hosted Allison Weatherbee (center), who in addition to sharing about Camp ASCCA as its director of community relations, shared her personal story as a Camp ASCCA camper and someone born without arms or legs. Now a public speaker, artist and author, Weatherbee serves an inspiration to others with various physical challenges, and works with others at Camp ASCCA to provide therapeutic recreation opportunities for children and adults with both physical and intellectual disabilities. She also thanked club members and Rotarians throughout the region for their special affinity for and support of the camp over the years. Pictured with Weatherbee is Club President Martee Moseley (right) and program host Bill Neville (left). Learn more about the camp at www.campascca.org.